BENGHAZI, Libya–Eastern Libyan military commander Khalifa Haftar, whose forces control parts of the country including Benghazi, said on Sunday the U.N.-backed government was obsolete and he would listen to the will of the people, a firm hint he may run in elections expected next year. Haftar styles himself as a strongman capable of ending the chaos of armed factions that has gripped oil-producing Libya since the overthrow of Muammar Gaddafi in 2011. His comments, made at a military graduation ceremony, recall those of Egyptian General Abdel Fattah al-Sisi when he was testing the ground before becoming a presidential candidate. Sisi was eventually elected in 2014. 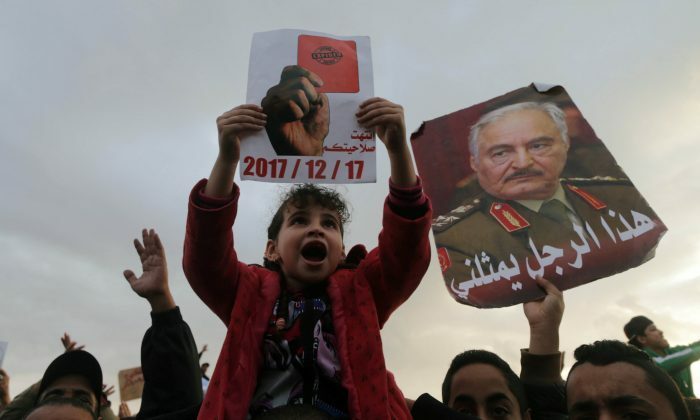 Just as Sisi built up wide support after toppling Egypt’s Islamist president Mohamed Mursi in 2013, supporters of Haftar speak of a similar situation developing in Libya, with rallies held in some eastern cities calling on him to run for office. Haftar also dismissed a series of U.N.-led talks to bridge differences between Libya’s two rival administrations, one linked to him in the east and one backed by the United Nations in the capital Tripoli, which he now declared obsolete. “Despite all the brilliant slogans during talks between rivals for power from the dialogue of Ghadames (Libya) and ending in Tunisia via Geneva, Skhirat (Morocco) and others, all of were just ink on paper,” he said, listing host cities of U.N. talks. The U.N. has tried to find a solution including Haftar who said his command had been threatened with sanctions should he seek a deal outside the dialogue. Some 1,000 Haftar supporters rallied in Benghazi, demanding the general take over after a U.N. deal for a political solution missed what they said was a self-imposed deadline on Sunday. The U.N. says no such timeline exists and its mediation will continue. The turnout was smaller than initially expected. 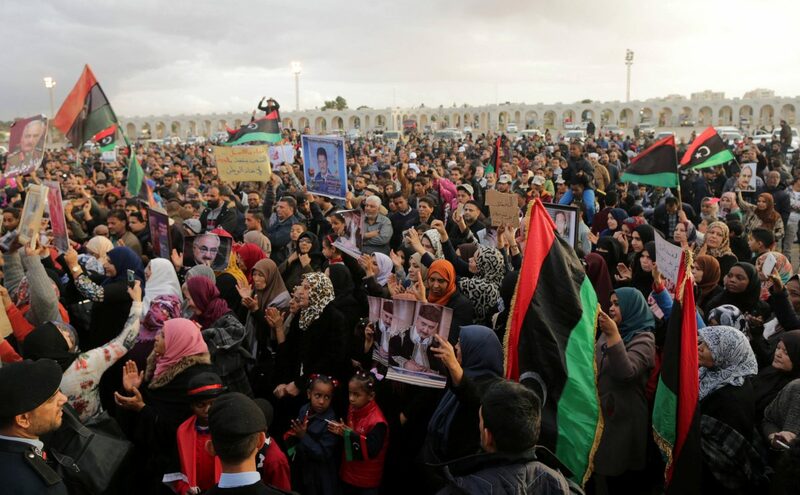 In Tripoli, home to a government opposed by Haftar, an unknown armed faction opened fire in the air to disperse some 150 supporters of the general on the central martyrs square, witnesses said. Nobody was hurt. The U.N. launched a new round of talks in September in Tunis between the rival factions to prepare for presidential and parliamentary elections in 2018, but they broke off after one month without any deal. 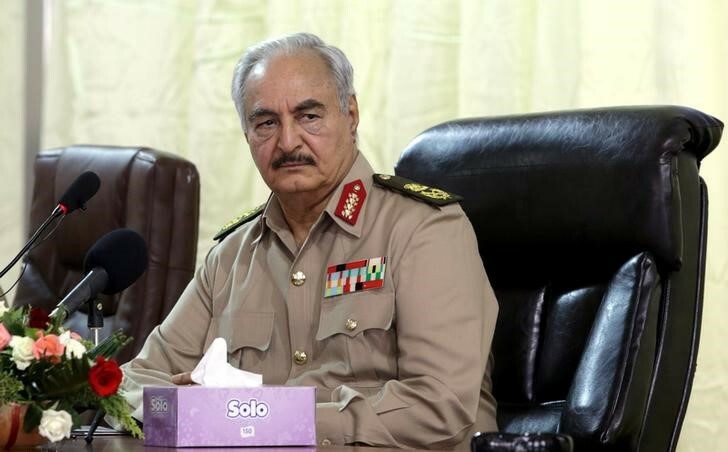 A formidable obstacle to progress was the issue of Haftar’s own rule. He remains popular among some Libyans in the east weary of the chaos but faces opposition from many in western Libya. In his speech Haftar said his forces, known as the Libyan National Army (LNA), could only be placed under an authority that had been elected by the Libyan people – a further indication that he might take part in the election. The large North African country has been in turmoil since Gaddafi’s downfall opened up space to Islamist militants and smuggling networks that have sent hundreds of thousands of migrants across the Mediterranean to Europe. Aguila Saleh, president of the eastern House of Representatives that backs Haftar, said it was time to start preparing for parliamentary and presidential elections, according to a video posted on social media. Think your friends would like to read this? Click share and help us all stay informed, and thank you for your support of The Epoch Times.